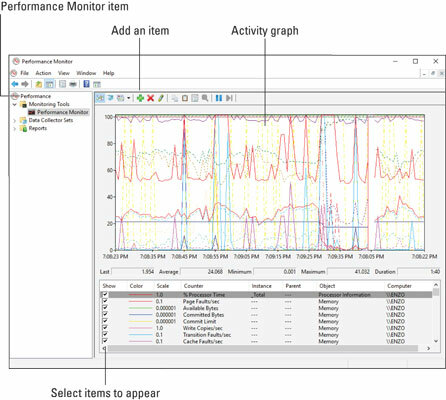 The Performance Monitor console is the most sophisticated of the Windows resource graphing tools. It’s also the most difficult to use, probably due to its origin as a Windows NT program. Tap the Windows key on the keyboard. Choose the Performance Monitor Desktop app from the top of the search results list. The Performance Monitor appears in a console window. From the left side of the console window, choose Performance Monitor. This item is located in the Monitoring Tools folder, as illustrated here. The Performance Monitor window is rather barren at first; you need to add items to the monitor to view the graph, especially one as detailed as the one shown. To add an item, click the Add (green plus) button. In the Add Counters dialog box, click to select a counter and then click the Add>> button. Click OK to view the results. Here, the Logical Disk, Memory, and Processor counters are selected. The display in the Performance Monitor can get rather hectic. Still, it offers plenty of details. If you need to get specific in monitoring an activity, this is the tool to use. For example, to monitor network traffic, add the Network Adapter counter to the display. Choose a specific counter to monitor by unchecking the other counters. For example, uncheck everything but Bytes Received to check incoming network traffic. • To clean up the display, select a counter and click the X (Cancel) button. You can Shift+click to select multiple counters and remove them all at once. • The difference between removing a counter and unchecking it is that you can more easily recheck a counter to again review its status.